Blog > Getting a Home Inspection? Here are 10 MUST-ASK questions for your home inspector. The inspector should ensure that both their inspection and their report will meet all applicable requirements in your state and that they’ll comply with standards of practice and codes of ethics. 2. How long have you been an inspector? How many inspections have you done? The home inspector should be able to provide his/her history in the profession and give references. New inspectors can be highly qualified, too, and many will work with more experienced inspectors to assist them in the inspection. 3. Are you experienced in residential inspections? Related experience in construction or engineering is helpful, but it’s no substitute for training and expertise in the unique discipline of residential home inspection. If the inspection is for a commercial property, the inspector should be asked about this, too. 4. Do you offer to do repairs or make improvements based on the inspection results? Some inspector associations and state regulations allow the inspector to perform repair work on problems uncovered in the inspection. Some states, however, see this as a conflict of interest and strictly forbid it. Know your state’s regulations and know your inspector. The average on-site time for a single home inspection is 2-3 hours (plan to stay for a while, and YES, you should be there). Anything less could mean your inspection is less than thorough. Costs for inspections vary dramatically, depending on your location, as well as the size and age of the house. The typical range is from $300-$500, but make sure you know the amount going in. 7. What type of inspection report do you provide? Ask to see samples of the inspector’s reports and determine whether or not you can understand his/her reporting style. Most inspectors provide their full report within 24 hours of the inspection. If the inspector says NO, find someone else. This is a huge red flag. You should always be able to attend the inspection and learn about the inner workings of your house. 9. 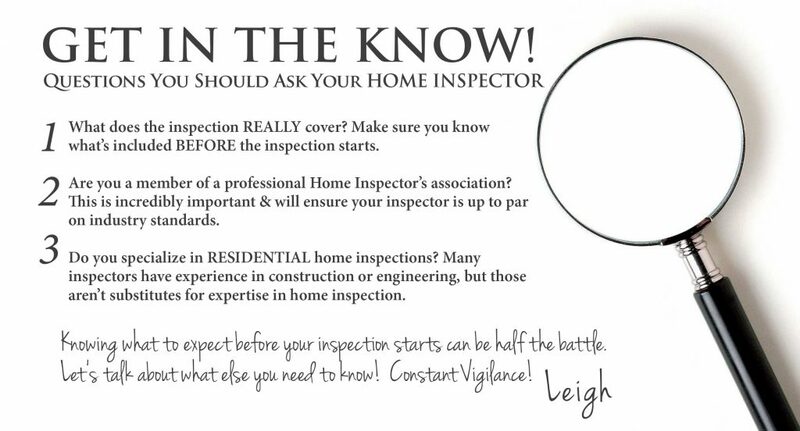 Are you a member of any professional associations of home inspectors? There are many state and national associations for home inspectors. Request to see their membership ID and perform whatever due diligence is necessary to determine the inspector’s qualifications. 10. Do you participate in continuing education programs? You can never know if all, and your inspector’s commitment to continuing education is a good measure of his/her professionalism.